Montréal, which is on traditional unceded territories of the Haudenosaunee, is the largest urban centre in Québec, a province notable for its large-scale grassroots organizing, from the 2012 student strike to heated opposition to the Energy East pipeline. Leap Montreal came on the scene last year to promote an interconnected vision of a just and sustainable future. The group recently joined a coalition called the Front Commun Pour La Transition Énergétique with more than 60 other environmental, Indigenous, civil, and labour groups across Québec planning for a transition away from fossil fuels. Leap Montreal hopes to raise the pressure on a newly elected, more progressive municipal government, while also pushing for change at the provincial level. I recently spoke with Leap Montreal organizers Anne McBryde, Bob McBryde and Nicolas Chevalier about what got them involved with the Leap and what it’s like organizing in the unique context of Montréal. Justin Fisher: What attracted you to the Leap Manifesto, and why did you decide to bring it to Montréal? Anne McBryde: Unless we make very, very big changes and make them very quickly indeed, we’re up for 4-6°C warming above pre-industrial levels by the end of the century. With that kind of warming and the ensuing climate disruption, vast parts of this planet could become uninhabitable, and communities that do survive will not be living on a planet that in any way resembles the world as we know it. Those with a vested interest in maintaining the status quo have used their extensive power and enormous wealth to ensure that most people are not properly informed about what the science is showing us. Our elites also claim that the money is not there to make the necessary changes. This is simply not true. If we cut subsidies to the oil sector, abolish tax havens, implement a financial-transaction tax, and make sure that corporations and the wealthy pay their fair share of taxes, all the money needed for a transition to a green economy would be available. The Leap Manifesto covers all these bases and more. It’s an evolving blueprint for hope, for people everywhere, including Montrealers. Bob McBryde: As far as bringing it to Montréal, Avi Lewis really shamed us into it! He was speaking in Montréal in April 2017 and pointed out that there was no local Leap chapter and how sad and shocking that was. So I decided to start a Leap group, something I had been thinking of anyway. Since then, others have taken up the challenge of keeping Leap Montreal afloat and making it thrive. Notably, Nicolas has done an amazing job in raising the group’s profile through his tireless work! Nicolas Chevalier: I first heard about the Leap Manifesto in 2015 and then went to the World Social Forum in Montréal in August 2016, where I assisted a panel with Naomi Klein, Maude Barlow, Mike Palecek of CUPW, and Bianca Mugyenyi from The Leap, and attended a workshop about implementing The Leap at local universities. I went back to university later in life and was mostly concerned with learning the material and getting good grades, but after the US election, I couldn’t believe what was happening. I felt the need to get involved and do something. I met Bob and Anne after that Avi Lewis talk, and they’re the real founders of Leap Montreal. Now we’re a core group of 4 or 5 people, with more coming on, but there are upwards of 70 people that have become connected to the group, which is amazing. My environmental studies gave me an appreciation for a holistic way of thinking that I recognize in The Leap. What I first felt passionate about was the protection of the environment, but now it’s also protecting equal rights for everybody. We certainly want to give The Leap a local flavour, but it is a fantastic start to building a fair and honest society. JF: Montréal offers a pretty unique context for organizing – a large, diverse, multi-lingual city. What is it like organizing in that context? What opportunities and challenges exist? BM: There are a number of wonderful organizations already working for climate and social justice in Montréal, and we want to partner with and complement these organizations, not become rivals! And of course we need to draw activists from and establish our credentials among French-speaking Quebecers. NC: There really is something of a French-English divide. For example, in the fight against Energy East, you had Coule Pas Chez Nous, which was a movement supported by Gabriel Nadeau-Dubois, but also the Council of Canadians and others working on it, and language really divided French and English organizers even though they shared a lot of the same ideals. But there’s progress. Leap Montréal doesn’t currently need to have meetings in both French and English, but we do it anyways for practice. We also have sub-groups addressing different areas of work, and the Education group, for example, has made presentations in both French and English. I started a “Localizing The Leap” sub-group, which is focused on connecting with local movements, telling them about the Leap Manifesto, and bridging our messages across different issues. We’ve worked with another group called Trainsparence around resistance to a poorly planned local rail project called REM; they’ve been going through a legal battle, but we think by working together we can really broaden the message of the movement. 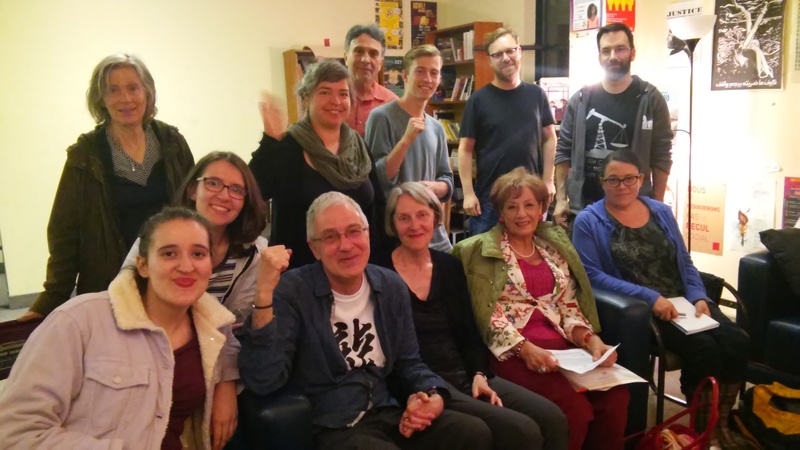 We’re also part of a Québec coalition called the Front Commun Pour La Transition Énergétique, or common front for the energy transition, which gives us a bridge towards more French-language organizing too. In Québec as a whole, there is a perspective that we have to preserve our language and culture. There’s some validity to that, although the original culture of this land is of course that of Indigenous peoples. But now some far right groups suggest that any attempts to bring in what are essentially climate refugees will dilute their way of life, and honestly what I think is that our way of life itself needs to be changed anyways. As far as preserving culture, that’s in the collective memory of a city or province, and just because a way of life changes doesn’t mean a culture has to change, they can go together. JF: This outreach to local movements sounds really promising, and very much in the spirit of The Leap. How have you found the process of linking up with other groups? NC: I spent a while just attending every event I could that was related in some way to the demands of the Leap Manifesto, and I connected with people and invited them to meetings. So far it’s been easiest to make connections with climate change-focused groups, but many other groups have been interested, and we’re working on finding ways to get more groups involved. We’d really like to get a space to hold a convening meeting like they’ve done in places like Thunder Bay and Peterborough, and see who comes to that. Of course, Montréal is such a large city that it would be impossible to include everyone in a single event, but it would be a good starting point. We see ourselves as a hub for all these movements, to connect them with each other. People I’ve talked to think The Leap is a great platform to build from. JF: You mentioned that so far the easiest connections you’ve made have been with climate change-focused groups, and of course Québec has been fertile ground for anti-pipeline and climate justice organizing in recent years. How does Leap Montreal fit into that picture? BM: This is where we are strong! The group is a meeting ground for climate justice and social justice thinkers and activists. Many of us Leapsters relish direct action organizing and being out in the streets! JF: Nicolas, you mentioned that Leap Montreal is part of the Front Commun Pour La Transition Énergétique, which is a really interesting coalition including more than 60 different groups from environmental, Indigenous rights, civil society, and labour movements. What’s the goal of the coalition and how is Leap Montreal involved? NC: Yes, the coalition has groups like Greenpeace Québec, 350 Canada, and the David Suzuki Foundation, but also smaller groups like Climate Justice Montréal, Boréalisation and a lot of citizens’ groups, as well as several unions. The Front Commun is pushing Québec’s elected officials at the municipal, provincial, and federal levels to be more ambitious in planning for a transition off of fossil fuels. Right now we see the provincial government trying to pass itself off as sustainable, but really they’re opening the door to more fracking and natural gas projects, with barely any recognition of Indigenous rights. When we first attended a meeting to establish shared principles for the coalition, there was no mention of the United Nations Declaration on the Rights of Indigenous Peoples, and it was clear that there were many people and voices that weren’t represented — from people of colour to lower socio-economic groups. There wasn’t a full image of how the transition needed to put frontline communities first. So that’s something we would like to work on, connecting the coalition to that lens of colonialism. We’re also taking part in planning something tentatively called the “Big Party for the Transition” — basically a festive weekend event bringing together lots of people from different backgrounds with food and panels to talk about what we want a just transition to look like. JF: The Projet Montréal party won a majority in Montréal’s 2017 municipal election. How does the change in local government affect the landscape in Montréal? NC: It’s a progressive government that’s already making positive changes, like reinstating the pedestrian pathway over the Turcot Interchange, a project that was cancelled by the previous mayor and the current provincial government. As far as the environment and inequality, and the intersection between them, we still need more ambition. There’s a lot of desire to hold this new government to account and not let them coast through the next several years, and we want to be a part of that, by creating lots of pressure from below. AM: Yes, the new administration is much more open to our priorities and demands. But like all politicians, they will need to be pushed, sometimes vigorously, by grassroots activists. For example, they need to hear loud and clear that public-private megaprojects are a dead end! JF: And now there’s a provincial election coming up in 2018. What are you looking forward to with that? NC: We’d like to organize a debate with representatives from NDP Québec, Québec Solidaire, and the Green Party, the ones most open to the Leap framework, and have them address the Leap Manifesto demands and whatever more localized Leap-inspired demands Montrealers come up with between now and then. We know that the mainstream media is always looking for buzzwords and catchphrases, so we’d like to take some control over the narrative by holding our own events and working with experienced grassroots press teams. We want the message that we need big changes on a very rapid scale to remain central in this election. JF: What else is Leap Montreal working on? AM: Leap groups around the country are engaged in a wide array of work, from hosting educational events, to drafting localized versions of the manifesto, to encouraging action in their communities, to organizing fundraisers for frontline Indigenous communities. It’s really up to us here in Montréal to decide what work we want to do! We know best what it is that our community needs. We share a commitment to the principles of the Leap Manifesto and to intersectional work that breaks down traditional silos between groups fighting for social and environmental justice. NC: One specific thing is trying to help Ellen Gabriel in her renewed Oka fight to defend Native land, and looking for ways to amplify the message. The land issue there has never been settled and people like Gabriel don’t get much mainstream coverage. JF: Finally, how can folks get involved with Leap Montreal? Bob McBryde has been a human rights defender and an environmental activist for over 35 years. A retired CEGEP professor, he has founded three environment action groups over the years. Bob also worked for 10 years as a host and writer/broadcaster with CBC’s Quebec Community Network, especially as a humorous and satirical storyteller. His two sons find his activities pointless and annoying. Anne McBryde is a professional translator and a street activist. She is especially involved in climate justice, human rights, refugee support, and feminist movements. The cause of Palestine is especially important for her. She is fascinated by the psychological impacts of climate disruption. Having been forced to leave her home country, Czechoslovakia, after the Soviet invasion of 1968, she feels a close kinship with other displaced folk, and this empathy fuels her activism. For Anne, the Leap is a living document that speaks to all of her concerns. Nicolas Chevalier is currently studying in environmental science with a minor in sustainable studies. Beyond academia, his priorities are with learning from the wealth of stakeholders who deserve equity and a better system to live in, as well as preserving the ecosystems that sustain the earth and its inhabitants.